Mostly islands and coastal regions of Central America and northern South America, including Venezuela, Mexico, Cuba, Puerto Rico and the Galapagos Islands. Salt water habitats including salt lakes and coastal lagoons. Flamingos are three to four feet tall, and weigh between six and eight pounds. Their bill is long and curves downward. 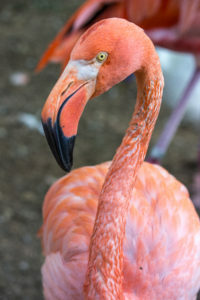 The most distinctive feature of the flamingo is its bright pink coloration, covering most of the body feathers. In the wild the life expectancy is 40 years, and in zoos it can be up to 50 years. In the wild flamingos eat crustaceans, algae, worms, mollusks, and some vegetation. In the zoo they get a special moistened food called Mazuri Flamingo Complete and Flamingo Breeder. During courtship, Flamingos perform a large group dance. They choose a mate based on which bird has the movements closest to theirs. Once they find a mate, they will build a volcano-shaped mud cone as a nest. The parents lay one egg and both take turns incubating. Once the chick hatches, the parents will feed it a nutrient-rich secretion similar to milk to help the chick grow. Flamingos are an iconic bird in American popular culture. Because of their quirky colors and interesting proportions, they have been seen in many movies, signage, and even front gardens. The croquet mallets in the Disney adaptation of Alice in Wonderland are flamingoes. Plastic pink flamingos have been a popular lawn decoration since the late 1950’s. Least Concern. In most of their range, American Flamingo population is increasing. They have been possibly extirpated, or gone extinct in a specific region, in Antigua and Barbuda. The Birmingham Zoo has hand raised over 50 flamingo chicks. Many of these were sent to other institutions, increasing the captive population of flamingos so that people around the country can view these majestic birds. The Zoo has a large population of over 20 flamingos! Flamingos are filter feeders. This means that they scoop up water and filter out tiny animals and plants to eat. Inside of their bill they have two lamellae, or comb-like bristles, that help catch the small pieces of food. Flamingos get their coloration from the crustaceans they eat, which contain beta-carotene. Flamingos often stand on one leg. When doing this they will pull the other leg close to their body to help conserve heat. Because flamingos get their coloration from what they eat, flamingo chicks lack the pink color for the first few months of their life. Flamingo chicks are born with fluffy white down feathers.